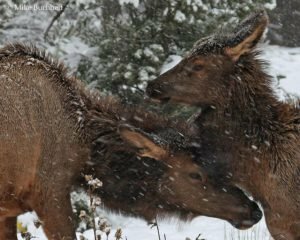 After a tinder dry Autumn, the first significant snowfall of the year is blanketing northern Arizona with a welcome dose of precipitation. From canyon cliffs to conifers, a pristine coat of powder is already gracing either rim—and more is on the way. The winter wonder comes with a bit of a trade-off. Park visitors and locals alike are dealing with slick roads, and limited visibility. Please remember to drive safely if you plan to visit for the remainder of the holidays. If you’re planning a hike or backpack, be sure to throw on another layer or two, and bring your trekking poles and ice cleats (both are available at the General Store in Grand Canyon Village if packing them…ahem…slipped your mind). Have a joyous finish to your year one and all.